For me, the holiday season offers a wonderful chance to embrace the celebratory aspects of life. But it can also amp up our anxieties and have our heads spinning with the stressful nuances that are common this time of year. The resetting of the calendar year has always been a time that I like to assess where my life is at and at least make some personal adjustments if they seem necessary. But even with some positive resolutions, there are years where I’ve still felt a sense that I wasn’t addressing the bigger questions or issues in my life. This confusion can cause a person pause and leave us wondering where we might find the answers to our biggest questions or issues. One year (I’m not sure if I made up this approach up or heard it somewhere), I decided to try something radical, and I’d like to share it with you. So, here’s my suggestion on solving life’s biggest personal mysteries (and keep in mind that there is no science or reputable data that suggests this is a good, or even prudent idea). The next time you’re feeling overwhelmed or confused with life or simply have no idea where to head next, buy a globe (I know, they’re not as common in the age of Google Earth, but they’re out there if you look for them). This small $30 investment (you don’t need anything expensive) is part of a larger exercise that I actually performed several years ago. The idea is this: When you’ve lost your sense of purpose, perhaps it’s time to throw yourself the whims of the universe; perhaps a journey outside of your comfort zone will provide a revealing level of enlightenment, e.g. the Hero’s Journey as author Joseph Campbell once suggested. It’s a crazy act, but sometimes crazy acts end up being the most meaningful. Here’s the process: Once you have a globe in hand, remove it from its base so all that remains is the cyclical orb. Sit down in a comfortable position and place the globe in your lap. Once you’re relaxed, close your eyes, take several deep breaths and begin to rotate the globe around in your hands. Your goal is to lose all sense of the globe’s locations. You should be completely unaware of north or south, east or west; you should have no idea where any of the continents or oceans lay beneath your fingers. As you spin the globe, try to clear your mind of all thoughts and distractions. Lose yourself inside your breathing. Yes, this is meditation, and while some may find it hokey, given what you’re about to do, it’s important to be completely comfortable and at peace. When you feel the moment is right, stop and place a marker onto the globe. This is the beginning of your journey. Depending on where fate has placed your marker (hopefully it’s not on North Korea or Iran), you now have a destination. When I performed this exercise, my marker landed on northern Sweden. I then dug out an extensive map of the country and using my best guess, determined that my destiny lay in Koskullskulle, a remote iron ore mining town with less than 1,000 inhabitants. I then went onto expedia.com and tried to establish the most logical route to Koskullskulle. As it turns out, Koskullskulle is not an easy place to get to and the projected costs associated with the trip far exceeded my means. Alas, my dream of heading abroad to Koskullskulle never materialized. My hope that a scruffy, enlightened sage (more likely an intoxicated Swedish miner) would somehow reveal the meaning of life to me were dashed. I suppose, ultimately, I wasn’t desperate enough to see my journey through, but the draw of the adventure remains inside of me and Koskullskulle continues to represent a personal Shangri La. And who knows… I may still get there one day. This week’s film, “Holmes & Watson,” also delves into some mysteries, albeit these mysteries pale in comparison to what I was talking about. 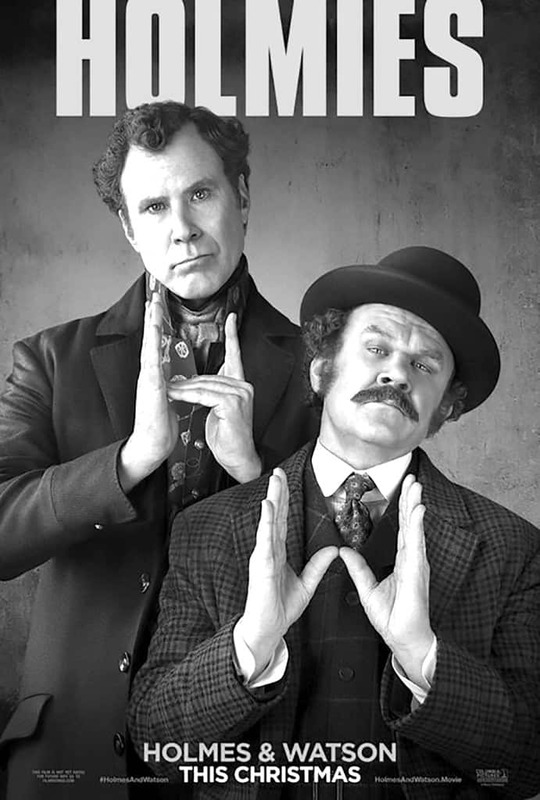 Starring Will Ferrell and John C. Reilly as the historical detective duo Sherlock Holmes and Dr. John Watson, this film attempts to mix intrigue and mystery with comedy. Unfortunately, even with two of Hollywood’s most high-profile slapstick actors, (who have had multiple past combo successes), this movie falls completely flat, offering little more than occasional laughs and a wholly uninteresting storyline. Look elsewhere for entertainment during your holiday break – your theater dollars are worth more than this. Got a question or comment for Dom? You can email him at moviediary@comcast.net.